As we get closer and closer to the release of Age of Ultron, the Avengers are infiltrating more and more random places in the continued bid for merchandising goodness. We've had toys of all sorts of sizes, horrifying Halloween costumes, and now, they're coming for your phone! The damn thing even lights up! 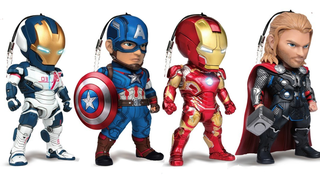 Actually, all of the charms but Cap have some kind of LED function. The Hulkbuster has the most, practically lit up like a giant Hulkbusting Christmas Tree, while the drone and Iron Man have light up eyes and chest pieces. For Thor, Mjolnir glows. Poor Cap is just left with a shiny shield instead of any light up goodness. As cool as these look, I'm not really sure how effective they can be as phone charms - I mean, they're 3-4 inches tall, which is pretty big to be strapping onto a phone to swing about willy nilly. And considering the series - you can only get them in the full pack of five - sets you back a whopping $70 to $80, it's not like you'd really want to damage them swinging around on your phone. In that regard it's almost a shame they are meant to be phone charms, they'd be much niftier as little toys to display.